Due to overwhelming demand, we now offer our full line of silicone XTreme Tape in our online store -- and it is available for purchase in single-roll quantities . 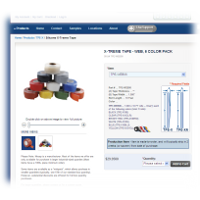 Choose from a wide array of colors, lengths, and tape widths. Silicone X-Treme Tape is the Original self-fusing silicone insulating & repair wrap. Originally developed for U.S. Military applications, X-Treme Tape has been tested and proven in the most extreme environments and conditions. It is the most easy-to-use and versatile emergency repair tape available. X-Treme Tape withstands extremes in temperature, pressure, voltage, moisture, corrosion and contaminants. Tests show the bonding strength of X-Treme Tape greatly exceed the Mil-Spec standard and that of competitor tapes. X-Treme Tape's strength comes from both its thickness and the advanced bonding characteristics of the special silicone formula. X‑Treme Tape has about 15% more material/thickness than rival brands making it the most reliable product available!